MACAU, Dec. 11, 2018 (GLOBE NEWSWIRE) -- Melco Resorts & Entertainment is proud to achieve a record-breaking milestone with ten Michelin stars among six of Melco’s signature restaurants by the Michelin guide 2019. Melco’s dedication to excellence has been well-acknowledged by receiving more stars this year and remains the leading integrated resort operator in the world with the most Michelin-starred restaurants. 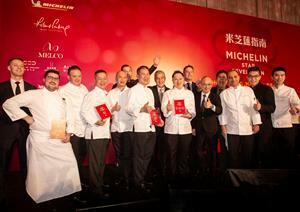 These achievements have been instrumental to putting Macau on the world map of gastronomy. Melco Resorts & Entertainment is proud to achieve a record-breaking milestone with ten Michelin stars among six of Melco’s signature restaurants by the Michelin guide. Mr. Au Yeung Man Yiu, Executive Chef of Jade Dragon, City of Dreams receives three Michelin stars for Jade Dragon in the awards ceremony announcing the results of the Michelin Guide Hong Kong Macau 2019. 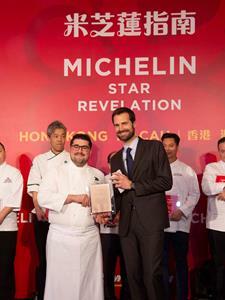 Mr. Pierre Marty, Chef de Cuisine at Alain Ducasse, City of Dreams receives two Michelin stars for Alain Ducasse at Morpheus in the awards ceremony announcing the results of the Michelin Guide Hong Kong Macau 2019. 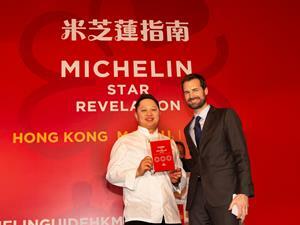 The Michelin Guide Hong Kong Macau 2019 awards ceremony took place in Macau today. Among the six signature restaurants across Melco’s properties, the ultimate French culinary experience provided by Alain Ducasse at Morpheus attained two stars in the latest Michelin guide in less than six months since its opening, while Jade Dragon has further set the benchmark for fine dining in Macau with three stars. The Melco restaurants that have received prestigious Michelin-grade culinary accolades include: City of Dreams’ Cantonese culinary masterpiece Jade Dragon (three stars), contemporary French dining destination The Tasting Room (two stars), French contemporary haute cuisine by the legendary chef Alain Ducasse at Morpheus (two stars), sushi specialist Shinji by Kanesaka (one star), Studio City’s Chinese restaurant Pearl Dragon (one star) and Altira Macau’s Ying (one star). Chinese omakase style restaurant Yí, contemporary French cuisine Voyages at Morpheus, Mediterranean cuisine Aurora and Japanese tempura specialist Tenmasa at Altira Macau, and Bi Ying at Studio City are being recommended by the Michelin Guide 2019.